Canada's all-time leading scorer, with 173 international goals, and A&W Canada hope to surpass $2 million in the restaurant chain's 10th annual Burgers to Beat MS campaign. 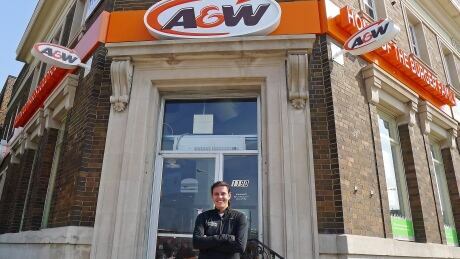 "It's been incredible to be part of it — to travel across Canada and spread the word and meet people," Sinclair said in an interview Wednesday at a Toronto A&W. "It's opened my eyes to a lot of things," added the 35-year-old from Burnaby, B.C. "Growing up, it was just my mum and that was all I knew really about MS. It's been incredible to meet a bunch of Canadians and hear their stories and try to have an impact on their lives." "There is real hope and promise," she said. "And we've gone a long way." "We're making huge steps. I have great hope that a cure is on the horizon. But importantly while we're searching for that cure, we're doing a lot in terms of looking at the ways in which we can help people living with MS live a better life today." Sinclair says her mother, who lives in a care home in suburban Vancouver, is doing all right. "She's hanging in there." "I think MS is a bit of a silent disease, where a lot of people don't know and haven't heard of it," she said. "But once you start to get involved with the cause and talk about, it you discover that some of your family, your acquaintances, almost everyone has that experience that they actually have someone within their circle that has been touched (by the disease)." "Her personal story is a very very touching one ... She's a private person but so many people know of her," said Senecal. "And this was a side of her story that no one knew about, I think, until she really became involved with us and with (the MS Society)," said Senecal. She will don Canada colours for a Nov. 2 friendly against Brazil in Ottawa and captain the Canadian women in October at the CONCACAF Women's Championship, which doubles as a World Cup qualifier.